(1) Show that the largest circle that fits inside a triangle whose sides have lengths 3, 4, 5 has radius 1. (2) Show that the largest circle that fits inside a triangle whose sides have lengths 5, 12, 13 has radius 2. 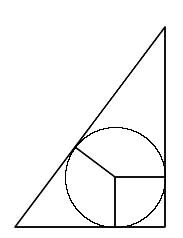 (3) Can you find a right-angled triangle such that the largest circle that fits inside it has radius 3? Of course, one such triangle has sides of lengths 9,12,15 (which is obtained by scaling the 3,4,5 triangle by a factor 3) but can you find another? What about an inradius of 4 or 5 or ...? Generalising. 2D shapes and their properties. Pythagoras' theorem. Polynomial functions and their roots. Mathematical reasoning & proof. Regular polygons and circles. Circle properties and circle theorems. Sine rule & cosine rule. Inequalities. Creating and manipulating expressions and formulae.